Once the linings have been glued in place, it is time to glue on the top and back. Although for many years I glued the top on first, I have now modified my process and glue on the back first. 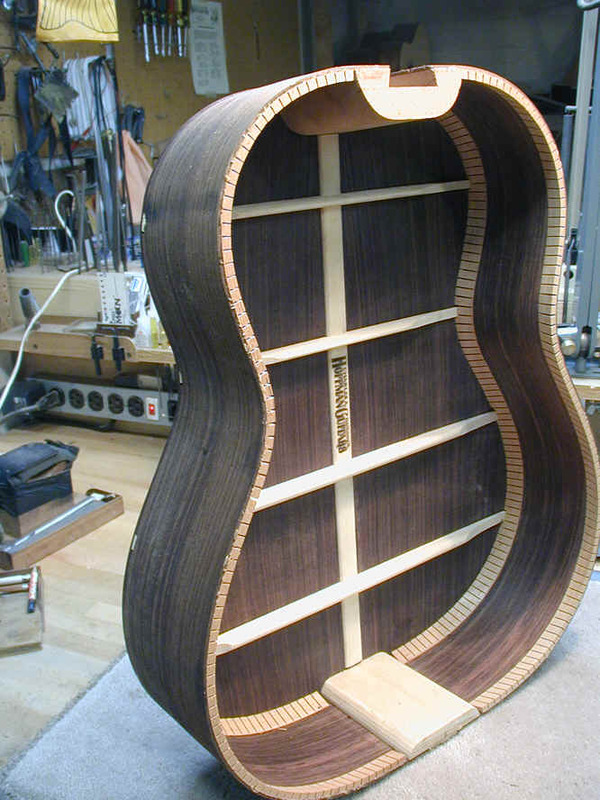 I decided to do this for two reasons: First, it is easier to shape the ribs to the correct curvature (arch), and second, any glue squeeze-out is more visible on the back, and it is easier to clean it up if the back is glued on before the top. To shape the ribs and linings for the curved back I use a domed sanding board. 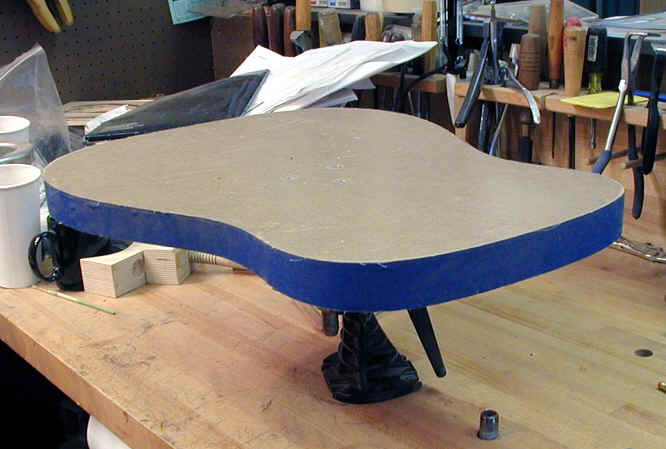 This has a 15' curvature (arch) cut in so that when I use it to sand the ribs (and the linings), they will have a curvature that exactly matches the 15' curvature of my backs. 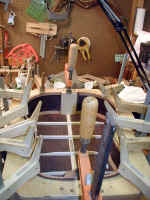 As can be seen from this photo and the next, I mount the form with the ribs in such a way that the sanding form can be rotated around a center post. Here the sanding form is in place on the center post. I installed the round handles to make it easier to manipulate the form. They are a loose fit so that they rotate as I rotate the form from side to side. this is the "working side" of the disc. The next step is to cut the notches for the braces. 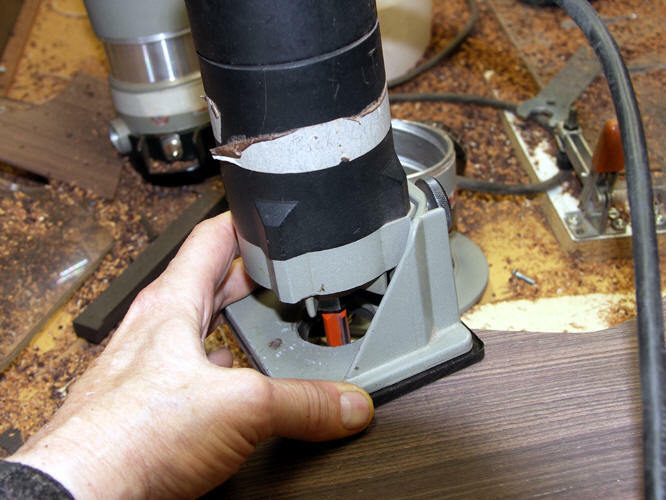 I now use a laminate trimmer, which works much better than the Dremel Tool I used to use. One way to do this is to use a Plexiglas jig which guides the trimmer. (This is visible in this photo). When I glue the braces on the back I carefully locate them to match the spacing of this jig. 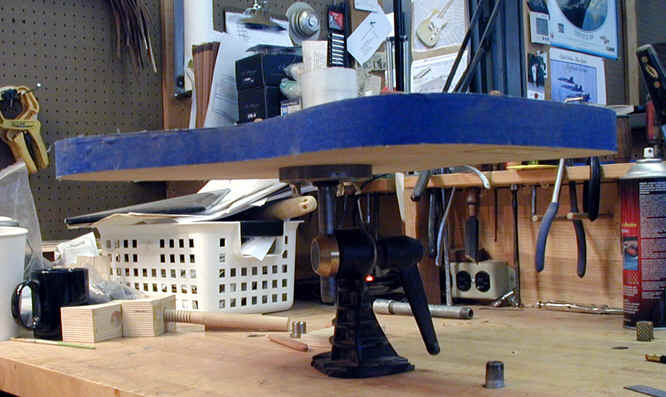 (For a photo of this, see HERE) This helps to ensure that the jig actually cuts the notches in the right place. 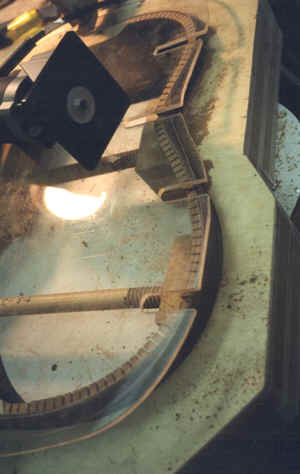 An alternative method, which is shown HERE, is to simply mark the actual location of the braces with a small blade and use the router to cut to these lines. This is the method that I use these days. 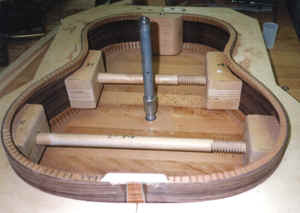 To clamp the sides to the back I use another jig which is a modified domed form from Guitarjigs. 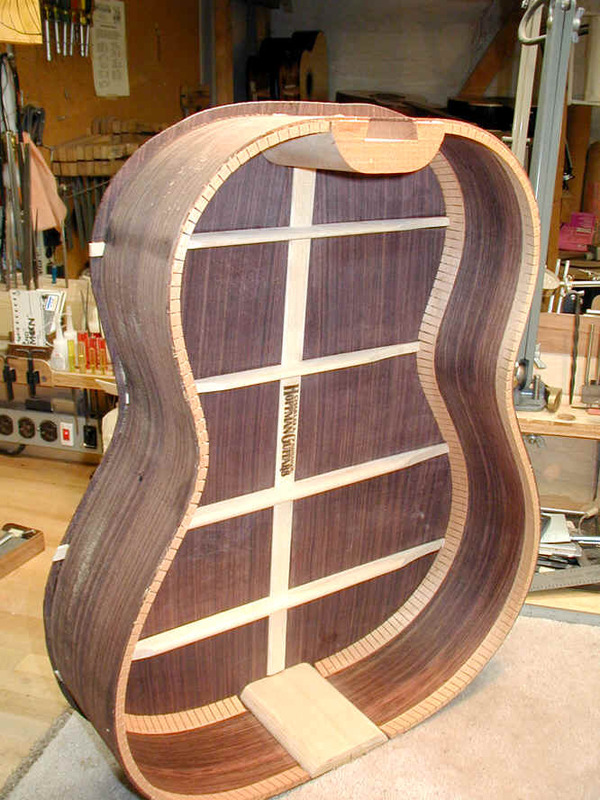 I cut the domed form to the correct size (actually this form works for both my D and concert size guitars), and simply lay the back on it. 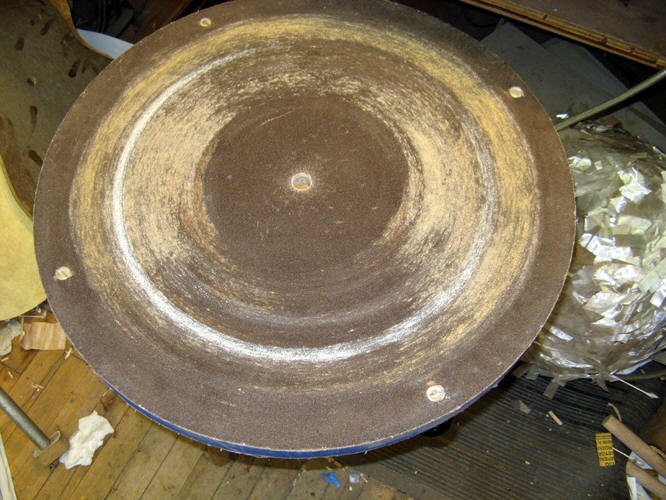 Since it is exactly the same shape as the sanding dome, and is quite smooth, it works well - applies even pressure without any fuss. 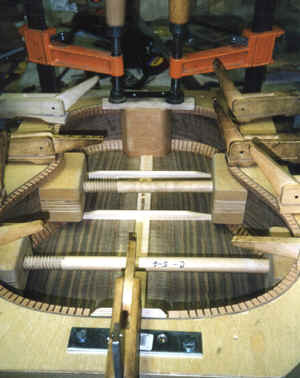 The back is placed on this, the ribs on top of the back, and clamping pressure is applied. 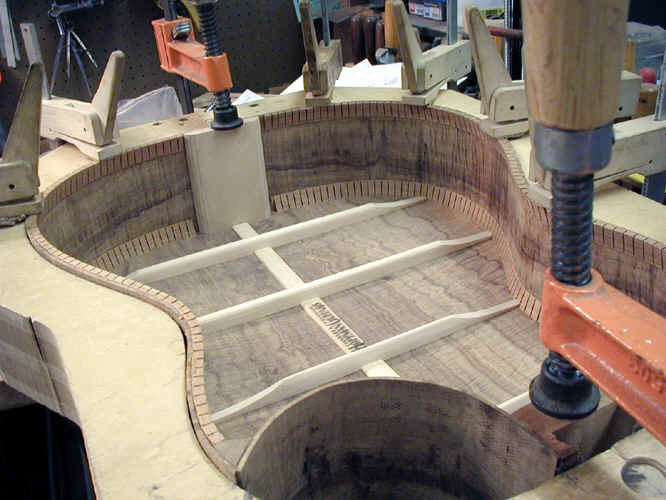 Because the ribs, the back, and the clamping jig have exactly the same curvature, the back fits very well and not a lot of pressure is necessary to ensure a good glue joint. The ribs being clamped to the back!! The working board (i.e. 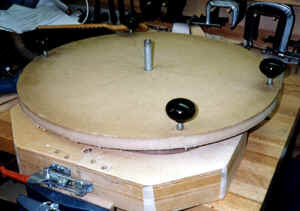 the domed board) is mounted on a carvers clamp which holds the whole thing in the air - which in turn makes it easy to get clamps in place. 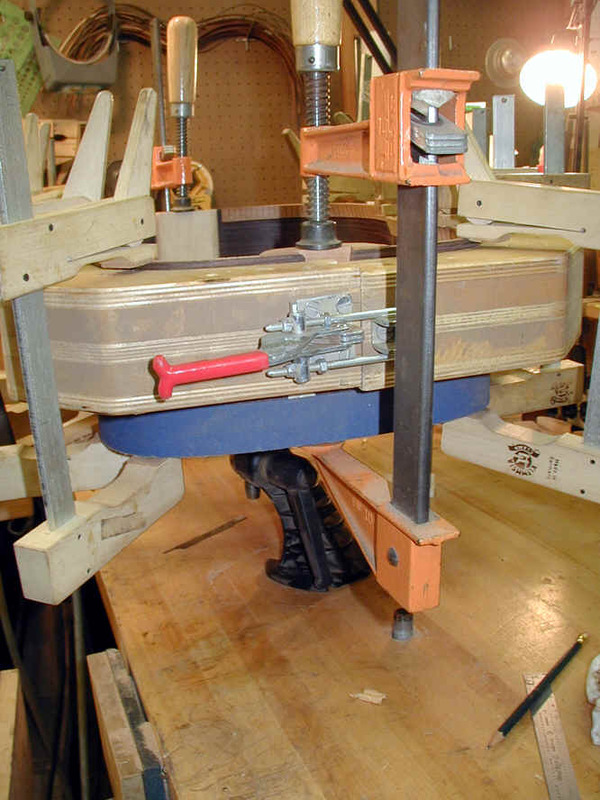 It also rotates easily for better access when placing the clamps. 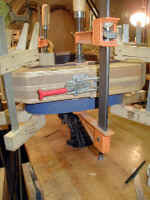 Here some of the clamps are taken off for a better view. The completed job before the back has been trimmed to size. I trim the back (and the top in due time) with a small router (a laminate trimmer) and a ball bearing guided flush cut bit. Simple and fast. the only precaution is not to let the bit go into the dovetail cavity and cut more off the back than I want. The back has had its "haircut".